From left to right: Bruce Wilson, Executive Director, Workforce Alliance North Bay; Brad Wagenknecht, Napa County Supervisor, District 1; Belia Ramos, Napa County Supervisor, District 5; Aaron Halimi, President, Renewable Properties; Alexandra McGee, Community Power Organizer, MCE. Renewable Properties, an investor and developer of small-scale utility and commercial solar energy projects throughout the U.S., is now constructing the American Canyon Solar Project in Napa County after months of development, planning and preparation. 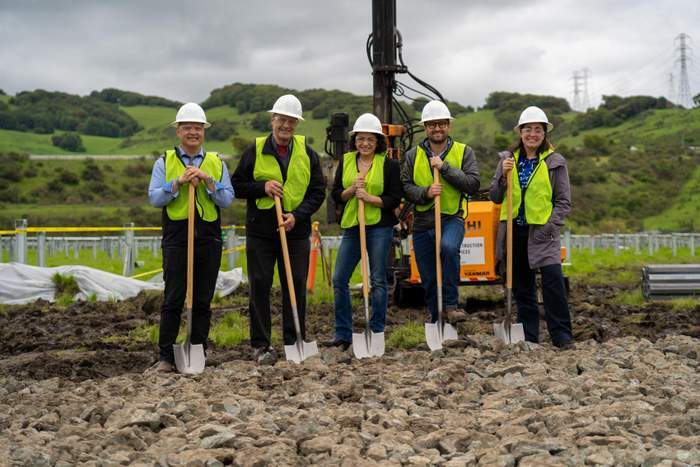 Renewable Properties developed the small-scale utility solar project that will supply Marin Clean Energy (MCE), California’s first Community Choice Aggregation Program, with 3 MWac of in-service area solar electricity. The project is expected to begin delivery electricity to MCE by July of this year through a 20-year power purchase agreement. Located on approximately 21 acres, the American Canyon Solar Project will utilize horizontal single-axis tracking solar photovoltaic (PV) technology. The annual electricity generated from the project is enough to meet the consumption of 1,000 average U.S. homes per year.